Hello. What’s up? Not much? Cool. Hey, I officially took over as your new Editor-in-Chief a few weeks ago. I wanted to take this opportunity to tell you what we’re changing around here. Yes, it includes the death of the numbered Jalopnik Review. Here’s an overview of the plan for your favorite (or least favorite) website. When we introduced the Jalopnik Review, we had a simple idea. We wanted to provide a quantifiable way to rank every single car we’ve driven. Makes sense. We had ten clear cut categories and a point system to go along with it. We were excited, we thought it was the future. The problem is, nearly every car got a 74. And while I maintain that the writing in them was some of the most fun and smartest out there, it didn’t provide the sort of consumer advice we wanted or the rankings system we desired. It was broken. But right now we do have something that provides this info in a simple and accessible way. It’s called The Bests and it’s a better execution of our original vision. So, as of today, the numbered Jalopnik Review no longer exists. That doesn’t mean we’ll stop reviewing cars. Far from it. But instead, our mandate is to now tell a story around the car. Have an adventure. Do something interesting. Be more free form. Bring you to the experience. Jason made a rad infographic where we’ll give you details on the car, what’s good, what’s bad, and if you want to get behind the wheel or if you should run as far from the open door as possible. It’s simple, clean, informative, and looks like a battery (!!!). I love it. The Bests are here to give you buying advice in a straightforward, no nonsense way, the new review is here to give you the fun side of the cars we drive with the fun, smart writing you’ve come to know and love. I’ll be expanding on this soon, but as you may have read here recently, nobody is doing motorcycle journalism justice. I think we’re in a position to be the publication that adds a fresh voice to the motorcycle industry with Lanesplitter, which is already doing great with admittedly little effort. We’re going to start updating regularly (Damon Lavrinc and Andrew Collins will be leading the effort), covering more motorcycle events, motorcycle and motorcycles, and I want to welcome former Jalop and current Indefinitely Wild man Wes Siler back into the fold as a columnist and contributor to our motorcycle coverage. In this internet age, information spreads quickly. And typically, that information appears across multiple platforms with no appreciable difference. A lot of the time, a video, ad, or report will be aggregated everywhere, ending up with every site having the same story. What’s the fun in that? How many times can you read about the same damn “hilarious” Craigslist post on different sites? So many. Jalopnik’s best and most memorable posts aren’t typically those that have roots elsewhere. They’re the ones that come from the deranged and borderline mentally ill minds of those that write for the site. I want more of that. We’re going to bring back recurring columns and get weird more often (if that’s possible). We’re also working on a system to bring in little blips from around the auto industry of stories that we think are interesting but we don’t have anything we can add. Think of it as your very own auto industry RSS curated by Jalopnik. More to come as this project comes to fruition. 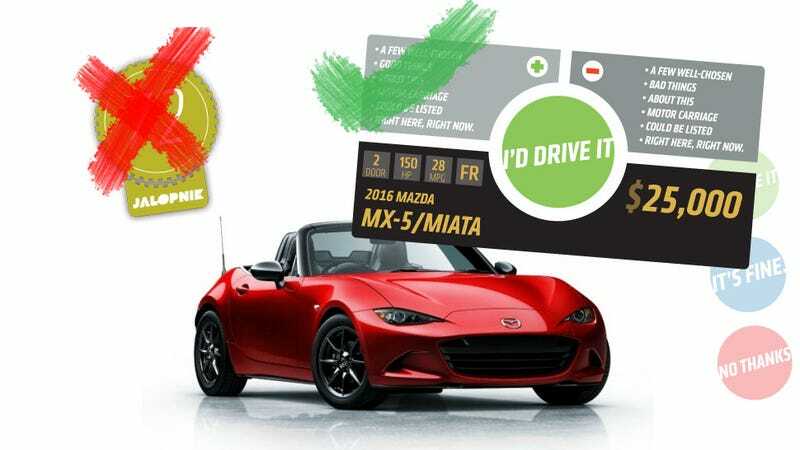 Wild rumors start pretty easily, and sometimes they end up running rampant because everyone decides to trust a publication that cites the friend of the brother of a Mazda product planner that there’ll be a new RX7 in five years. There’s never a new RX7. I think we’re all tired of these rumors getting out of hand as well as putting our faith in someone else’s reporting and sourcing. So instead of trusting a rumor from Swaziland’s fourth most popular car magazine, we’re going to find out what’s up on our own and communicate more with the companies and people that we cover to get you a better story. If you run a website and have a great story, send an email to tips@jalopnik.com with the subject “Syndication.” Let’s see what we can do. I’ve been blathering on, but what do you want to see on Jalopnik? Send me an email (also no, I’m not currently looking to expand the staff). Leave a comment below. Tweet me. I’m around and listening.